a ‘scrub bashing’ group that will work on the Nature Reserve Park Field. Harry Ward will be the group leader as before. 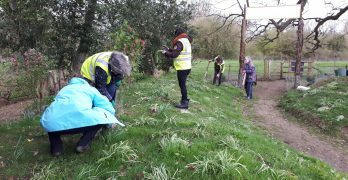 Prime tasks will be to check the stability of the rabbit wire, undertake weeding and watering and standard maintenance work, including the tidying up of paths and checking that the young trees on the perimeter are watered and weeded around their bases. 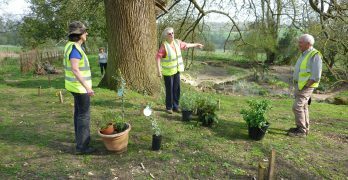 Under Sarah’s direction, preparation for the next Big Plant Up will commence from August/September and members of the Gardening Group will be involved in this process. 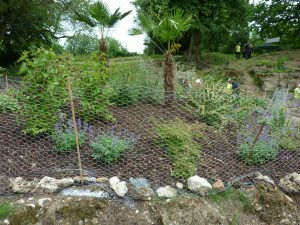 The Anthony Parson’s planting bed against the Retaining Wall, which is currently covered by a weed suppressing membrane is expected to be planted up in the Autumn. As reported elsewhere, the WHBC is reaching an agreement with the Mid-Herts Scouting organisation to undertake a voluntary task of fitting anti-rabbit fencing to the cattle fence on the perimeter of the Fernery. Until that task is complete it will be necessary to continue to install rabbit wire around all new planting. A team will collect tools from the Fernery shed and then gather at the corral in the Park Field to continue the work of clearing the scrub away from the base and surrounds of the sequoia tree. The Welwyn cubs and scouters did some work further along the path last Thursday evening 12th July 2018 and if resources and time permit, then the SBT team should tidy up using use bow saws to reduce lopped scrub down to ground level, and strim nettles from the sides of the paths about 1 metre back. Paths continue to be invaded by bramble runners which need to be cut back using secateurs. Dog walkers have started doing a good job at this but the task is never-ending. The section parallel to House drive where a few years ago the CMS undertook some hedge layering. General – all the small tree saplings growing along/into the stock fence boundary should be cut off at ground level. They are a mixture of ash, elm and oak. 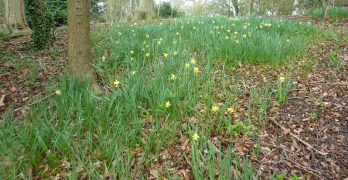 Next month, in August, the scrub coppicing in the sunken track that was started at the sides 2 years ago could be re-commenced. We have a constant need to encourage volunteers to attend Leaders, and First Aid Courses. Until we are in a position where we can physically have a 1st Aider with each group, Harry (with 1st Aider qualifications) will be the leader in the Fernery on 19th July, and John will be the leader in the Fernery Field. Sub projects and activities will be led by Andrew and Lucy. Telephone contact will be maintained between both groups at all times with ‘formal’ checks on the hour at 11 and 12 pm. The Scrub Bashing Team will complete their tasks and return tools etc back to the Fernery by 12 p.m. The full team will meet at the Fernery at 10 a.m. for briefing and allocation of tasks, and for the issue of appropriate tools. If possible a First Aider will attend each group, but failing that, then the respective leaders will maintain telephone contact. For those not familiar with the location of the Fernery, full details may be found on the website, but simply stated the closest access point is North Ride, on the Danesbury Estate, AL6 9RD. Either park in North Ride, or take the right hand fork of the unmade Road which leads to Danesbury Park Road, and an entrance is about 500 metres on the right not far from a lay-by. Tea breaks will of necessity be separate, but we will aim to meet up together as a group at 12 p.m. in the Fernery for a de-brief. Please bring a drink with you, and wear strong boots or shoes and have strong gardening gloves too. In response to a request for projects that will encourage community involvement among scouts of all ages and abilities, the WHBC Landscape & Ecology Department has proposed to Tony Lyall, Mid-Herts District Commissioner, that groups of Explorer Scouts (14-18 year olds) might ‘rabbit proof’ the cattle fence which surrounds the Danesbury Fernery. This news will come as a great relief to the Danesbury Fernery Gardening Group who have had to watch their new plants getting steadily attacked by local rabbits. Not that the volunteers have stood by and done nothing – on the contrary – rabbit/chicken wire has had to be painstakingly fixed around the outside of all the new planting beds, with some success. No rabbits or chickens, but some slugs, have been getting through. But with new planting beds being developed and planted up, the better long term course will be to keep the rabbits out of the Fernery altogether and, in so doing, ease the maintenance of the planting beds and further improve their appearance. WHBC’s Ann MacDonald has provided the scouts with the following Specification which includes an ingenious reward never offered to regular volunteers! In principle, the task is to fix rabbit fencing to an existing cattle fence, I will have a machine scrape back the soil before you start and the task would be to fix the rabbit fencing to the existing cattle fence and then tread back the soil. Gates will require closer thought, perhaps a design problem the Scouts can wrestle with? It’s a simple task but there is a fair amount, not a whole field, but probably 600 linear metres. I should think you’d need to schedule 6 work parties, we will provide the materials. We could supply pizza at the end of each work party for a job well done. We have to hope that scouts will find the promise of pizza more compelling than do the rabbits find the promise of succulent geraniums, and that they take up the Invitation to rabbit proof the Danesbury Fernery for us before our next major planting exercise scheduled for Autumn 2018. Ed: The truth will out, Tony Lyall admits that: the District has 4 Explorer Scout Units, each of which averages about 15 members though we never ever get 100% attendance at anything (unless there’s free pizza) so we can either look to do one big project or maybe 4 smaller ones.